Charlotte and Eleanor have a home! 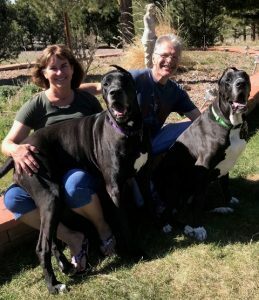 - Rocky Mountain Great Dane Rescue, Inc.
Charlotte and Eleanor have a home with their foster family in Parker, CO! Randy & LeeAnn wanted to try fostering to get to know the Dane breed, and boy did they! They didn’t hesitate when Charlotte and Eleanor needed a foster home together, and it wasn’t long before they realized these two sisters were home to stay! They will be the only pets for Randy & LeeAnn, and will enjoy many walks, and outings. You may even see Charlotte and Elanor at a few local events too! We are so happy for the girls and their new home!